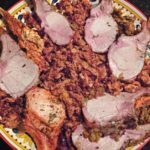 Herb-Roasted Rack of Pork is an easy meal that’s fancy enough to impress at Christmas, Easter, or any special-occasion dinner. The roast is cut into gigantic chops that are more than enough for one person (I usually eat half of one). As a side note, I also turn into a vulture around holidays. By this I mean that I start watching meat specials at the supermarket and my favorite wholesale club, not only noticing what’s on sale, but also taking note of the sell-by dates on my favorite cuts of meat. I revisit the store a few days before said sell-by dates and I almost always score some really good meat at a truly fantastic price. It’s a great trick that I learned only very recently. Back to that Herb-Roasted Rack of Pork. These roasts are usually sold vacuum-packed in brine, already Frenched. I always rinse the pork well before roasting it because the brine usually contains other stinky things like nitrates and phosphates. We want as little of that as possible in our roast. I score the meat so I can rub my herby-garlicky-mustardy mixture into the fat cap and the meat itself. After that, the total roasting time rarely exceeds 1.5 hours. Another aside here: I used to hate pork because it was almost always overcooked and dry. That’s because the recommended cooking temperature used to be 160º F. At this temperature, pork adopts a sad, grey color and a consistency that approximates shoe leather. But a few years ago, the USDA relaxed these guidelines: it now recommends cooking pork to an internal temperature of 145º F: the pork is still succulent—and yes, still a bit on the pink side. RELAX. It’s delicious. 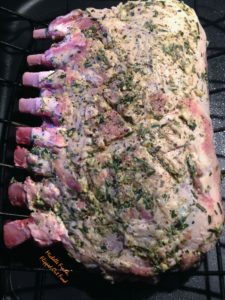 When the meat has rested sufficiently, I cut the herb-roasted rack of pork into chops, using the bones as guides. 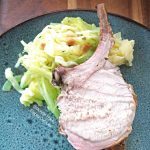 I love to serve these chops with stuffing (I added cranberries to this recipe), although I’ve also gone with Meal-Prep Creamy Mashed Potatoes, Irish Colcannon with Cabbage and Leeks, or even a salad (like my Arugula-Shaved-Fennel Salad). Bon appétit! If you have leftover Herb-Roasted Rack of Pork, slice it up thinly and use it in my decadent Cubano Quesadillas! I hope your family loves this festive roast. Happy Holidays! P.S. If you need some ideas for how to use up your leftovers, check out my post on Using up Leftovers! #CookBlogShare (coming soon! ), a great food blogger recipe-share hosted this week at Everyday Healthy Recipes. The What’s For Dinner Sunday Linkup (coming soon!) at The Lazy Gastronome. This is an easy meal that's fancy enough to impress at Christmas, Easter, or any special-occasion dinner. The roast is cut into gigantic chops that are more than enough for one person (I usually eat half of one). 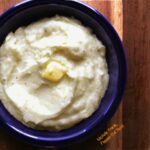 Delicious served with stuffing, mashed potatoes, or even with a simple house salad. Carefully rinse the pork and pat dry with paper toweling. Score the fat (make shallow cuts in a criss-cross pattern). Mix the remaining ingredients and rub the mixture evenly over the meat, down into the score cuts, and in between the rib bones. Place roast (fat side up) on a rack set in a roasting pan (line the pan with aluminum foil first if you want an easier clean-up). Place the roasting pan in the oven for 20 minutes. Reduce the temperature to 350º F and continue roasting until an instant-read thermometer (inserted into the thickest part of the meat) reads 137º F (~45 additional minutes to an hour)**. Remove the roast to a cutting board and tent with foil. Let rest for at least 20 minutes (the temperature will continue to rise as the meat rests. Slice into chops, using the rib bones as guides. Arrange on a platter and serve. 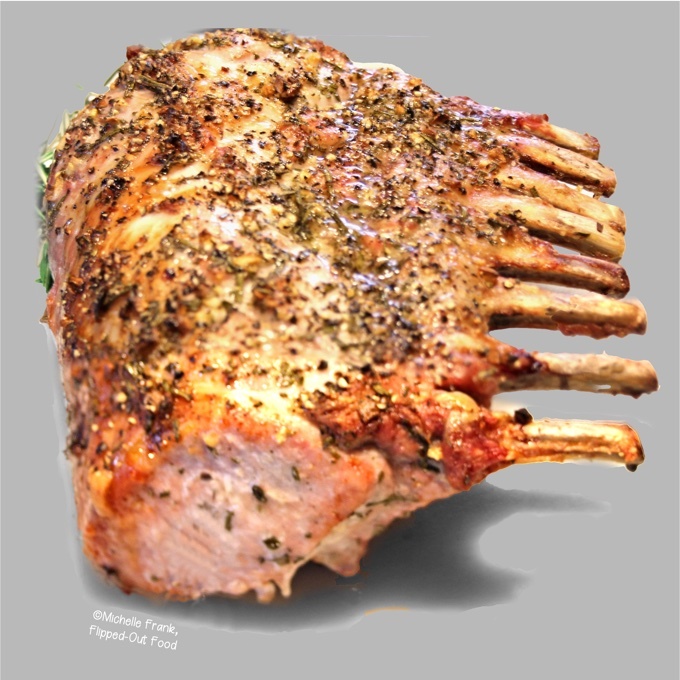 *Wholesale clubs (e.g., Sam's or Costco) often sell these pork roasts around holidays. The roasts I've found are already Frenched: the bones protrude without any meat in between. You can ask the butcher to do this for you if necessary. **Note that there may still be some pink in the pork roast. This is okay. As long as the roast reaches an internal temperature of 145º F (which it will when it rests), the USDA says that this is fine. Piquant Cabbage-Bacon-Onion Saute: perhaps the perfect side dish for roast pork. Tangy, smoky, and slightly sweet, I almost named it “Sweet ‘n’ Sauerkraut”. 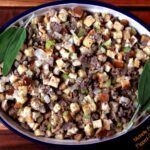 Easy Sausage Stuffing: this vintage recipe has been a fixture on the Thanksgiving/ Christmas Day table for decades. 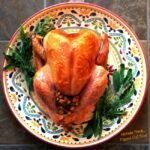 Perfect for any festive occasion involving pork, turkey, duck, or Cornish game hens. Ultimate Classic Roast Turkey turns out perfectly juicy every time thanks to a wine-and-butter-soaked cheesecloth that keeps the turkey from drying out for most of the roasting time. This meal really is a showstopping way to serve pork. It sounds absolutely delicious and that pork looks perfectly cooked too. Thanks for sharing with #CookOnceEatTwice! Thank you, Corina! We’re huge pork fans over here, so this one never disappoints! This looks amazing! Looks perfect for the holidays! Love your “vulture” story! Thank you for sharing with our Delicious Dishes Recipe Party. Merry Christmas! This sounds delicious and such an easy recipe to feed a crowd with for a special occasion! Thank you, Corina! I’ve found that a lot of people have never eaten pork served this way, so it’s extra special! Your recipe looks so good! Love that it only has 5 ingredients and it looks so delicious! Can’t wait to try it soon! Beautiful recipe! Perfect for the holidays but I’d make it any time! I love holidays when you can break out all the stops, what a fabulous meal!! Thanks, Debra! I feel the same way! Using a thermometer really helps gauge when meats are done, and makes such a difference! I am sure this pork is wonderful when cooked right! 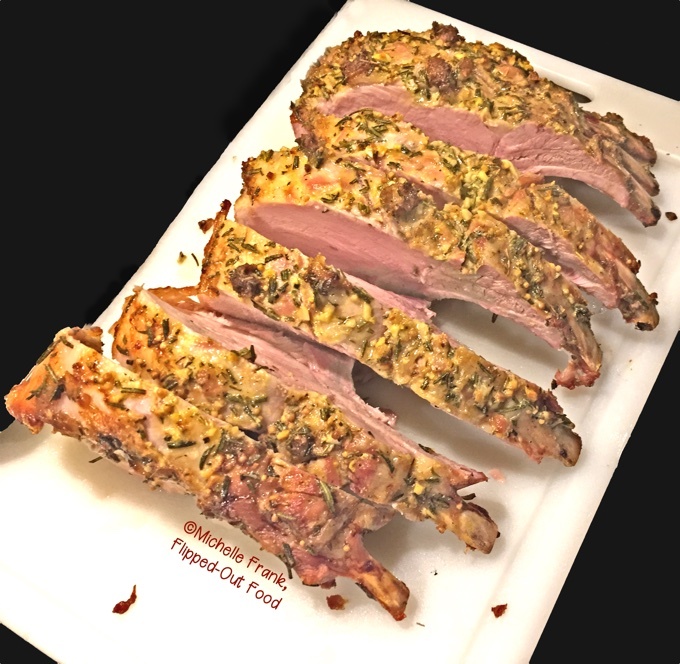 I have never tried pork before,but this recipe sounds good to me! I wish I can try with chicken!